Probably one of the first recipes I ever used from Cooking Light magazine. This was in the January/February 2007 issue. And it was delicious again yesterday. Preheat oven to 350. Cook pasta according to package, omitting salt and fat. Drain. Heat marinara sauce in a large saucepan over medium heat. Add salt, pepper, and spinach, stirring until blended, cook for 10 minutes, stirring occasionally. Remove from heat; stir in cooked pasta. Coat 9x13 baking dish with cooking spray. Spoon half of pasta mixture in to dish. 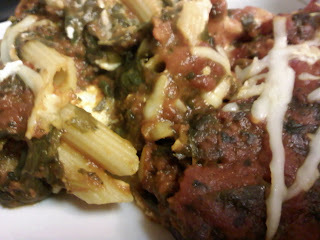 Combine sour cream, smoked cheese, and basil; spread over pasta in dish. Spoon remaining pasta over the top. Sprinkle with Parmigiano cheese. Bake at 350 for 25 minutes or until bubbly. Let stand for 10 minutes before serving.